WATERLOO, ON – Brick Brewery released Red Baron Light this week, a new extension of their Red Baron brand that joins the brewery’s flagship Red Baron Lager and recently launched Red Baron Lime. 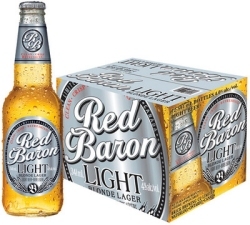 Red Baron Light is available now at The Beer Store in Ontario, selling for $15.95 per 12-pack. Hmmm…looks an awful lot like PC Light…made by the same company…with probably an identical flavour profile. I guess if it’s the same beer, you just look for whatever one is cheaper. Went to the high school on University Ave called Wilfrid Laurier University – great to be drinking a beer from my roots. If it was my beer, I would colour the beer cap RED – this would be give the bottle a great marketing touch resulting in greater sales. Believe me, I am very good at marketing.